MIAMI, WILLEMSTAD - A Canadian known as "Russian Mike" who has been charged in the drug trafficking case involving notorious Mexican drug lord Joaquin "El Chapo" Guzman sought Thursday to block his extradition to the U.S. from Curaçao. Mykhaylo Koretskyy, who was born in Ukraine, appeared before a three-judge panel at an extradition hearing in Curaçao, where he was arrested earlier this year after arriving on a flight from Canada. It was a continuation of a hearing that began Tuesday. Koretskyy, 43, has been indicted in federal court in New York on charges that include conspiracy to import cocaine. U.S. court records list him among the defendants in the case that includes Guzman and say he also goes by the nickname "Cobra." The indictment, unsealed when he was arrested in January, alleges he took part in a drug smuggling conspiracy from 2008 to 2014, but does not go into detail about any connection to Guzman, who was turned over to U.S. authorities in 2017. Guzman has pleaded not guilty to charges that his Sinaloa Cartel laundered billions of dollars and oversaw a campaign of murders and kidnappings. Koretskyy was arrested upon arriving in Curaçao with his family and has been in custody ever since. 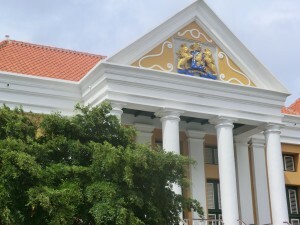 The island, as part of the Dutch Kingdom, has an extradition treaty with the U.S. but a decision on whether to send him to New York is not expected for several weeks. Jeffrey Lichtman, a lawyer for Koretskyy, said the defence is challenging the extradition in part because the U.S. government waited so long to seek his arrest on a grand jury indictment issued in 2014 despite the fact that authorities knew where he lived in Toronto. He said the delay will make it harder to locate witnesses and mount a defence. "He wasn't hiding. He was in plain sight," said the New York-based Lichtman. "How do you defence yourself after all these years?" The lawyer said he is also prepared for the next step if the judges in Curaçao rule against Koretskyy. "If he is extradited and brought back to the U.S., we are prepared to try his case."